11 x 17 Aluminum Clipboard w/Storage Compartment - GS Direct, Inc. 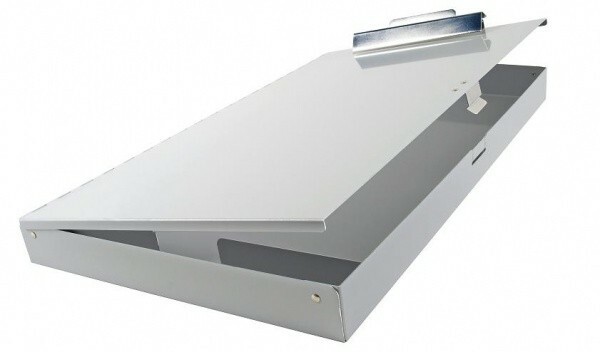 This 11" x 17" aluminum clipboard with storage area is a storage box and clipboard in one. The innovative design includes a rectangular aluminum storage box with a pen/pencil holder. The clipboard is the lid, securing up to 1" of 11" x 17" drawings or documents. The high-capacity clip is centered near the edge of the shorter 11" side. All edges are rounded on our clipboards with built-in storage compartments. Opens to 1” maximum height. Built-in pen tray and Self-locking latch.